Why does this chilly bird look so fat? This tufted titmouse has fluffed out its feathers to keep warm in the wind and frigid temperatures. It’s probably also shivering to produce extra body heat. And every day it puts on fat that it then burns overnight to stay warm. How do the birds that spend the winter in Westborough keep warm? We have birds that stay around all winter, like the tufted titmouse (Parus bicolor, Baeolophus bicolor) in our photo. Many of these residents frequent our birdfeeders, including black-capped chickadees (our state bird), northern cardinals, white-breasted nuthatches, and downy woodpeckers. Other birds that we see around include cedar waxwings, owls, red-tailed hawks, and other hawks. Strange as it may seem, some birds actually come here for the winter from more northern locations. These travelers include dark-eyed juncos, golden-crowned kinglets, pine siskins, and even some robins from Canada that spend the winter in Westborough’s wooded areas. They all face the problem of surviving the cold. One of the first things that birds do to keep warm is to fluff their feathers, as our chilly titmouse has done. The feathers are good insulation. When birds fluff them, they increase the air spaces among them, which traps heat close to their bodies and provides wind protection. Birds can fluff their feathers thanks to a network of tiny muscles that move their feathers. We think of feathers as light – and they are – but a bird’s coat of feathers typically weighs twice as much as its skeleton (which is hollow). Feathers make up about 15-20 percent of its total weight. Birds lose heat from the few areas of their bodies that typically aren’t protected by feathers – their legs and feet, beaks, and eyes. They tuck the bare parts into their feathers, just as we might put our hands in our pockets or under our arms on a cold day. You may have noticed a bird standing or perching on one leg with the other leg tucked up close to its body, or sitting on its feet to keep them covered. Birds also rest with their heads turned so that beak and eyes are tucked into its feathers. To keep warm, birds sometimes change where they spend time. In cold, windy weather, a titmouse is more likely to look for food closer to the ground – within about 6 feet of the ground – than up in the windblown treetops. And you’ve probably seen birds perched in sunny spots early in the morning, late in the afternoon, and on cold, bright days. On very cold days birds may fly less, since they lose heat when they fly and, in effect, make their own breeze. Birds also take shelter. Birds such as titmice and chickadees perch in dense evergreens or squeeze into tree holes, natural crevices, or cracks in buildings, where they’re out of the wind. They do this especially at night, when it’s even colder out. Woodpeckers sometimes make holes for themselves in the fall and use them for shelter in winter. That crazy downy woodpecker that pecks your house in the fall may be trying to do just that! Some birds, such as ruffed grouse, burrow into deep snow for the night. For that they need 10 inches or more of snow. Many birds are in flocks for fall and winter, and certain birds huddle together to keep warm at night. Eastern bluebirds, which sometimes remain in Westborough during mild winters, may huddle together in a tree hole or hollow log in groups of up to ten. Yet it’s no surprise that these actions aren’t enough to keep birds warm. As temperatures drop, birds have to crank out more body heat to keep warm. Birds are warm-blooded, just as we are, but their normal body temperatures are higher than ours – typically between 104 and 108 degrees F, depending on the kind of bird. That means birds’ metabolism is higher than ours, and they burn fuel at a faster rate. Birds can generally triple their metabolic rate, creating a lot of heat. Like us, birds shiver to produce extra body heat. (So do butterflies! On spring mornings, sometimes when snow is still on the ground, you might spot a mourning cloak butterfly shivering to warm itself up enough to fly.) Shivering in birds and butterflies is the same thing it is in us – muscle contractions that we don’t consciously control, which produce heat. As outside temperatures drop, birds need to pump out even more body heat, and to do that they need to eat – a lot. In fact, many birds fatten up each day, only to burn that fat overnight to keep warm. For example, our tufted titmouse weighs about 20 grams, but at dusk it’s about 2 grams – or about 10 percent – heavier than it is at dawn for this very reason. That’s like yo-yo dieting on a daily basis! In very cold weather, birds that don’t find enough to eat during the day can die from the cold overnight. To get enough to eat, many of the birds that stick around Westborough for the winter have a broad, variable diet. They eat different foods at different times of year, increasing the chances that they can always find something. Titmice, like their relatives the chickadees, eat mainly insects for much of the year but switch to consuming more seeds and nuts in the fall and winter, when insect food is scarce. Titmice specialize in eating acorns and beechnuts, so they tend to live in places where oak and beech trees grow, like Westborough. For extra insurance, titmice and chickadees also cache, or hide, food in many scattered hiding places. When you see one flying away from a feeder with a sunflower seed, you know the bird may eat it or hide it. These birds have good memories for where they’ve stored food. Tufted titmice typically hide sunflower seeds under bark or in cracks on trees. Some birds, including our chickadees, have a special way of conserving energy on cold nights. They can lower their body temperature in a controlled way. They do this by shivering less. Their body temperature at night may be 12 or 15 degrees F lower than it is during the day, but they stay warm enough to fly. By turning down their bodily thermostats, they save energy that they would otherwise use to keep warmer. For example, this lets them use about 25 percent less energy per hour when it’s freezing out (32 degrees F). Hummingbirds also use a similar energy-saving trick, but they don’t stick around here for the winter! What about migration? Is it mainly a way of escaping the cold? More likely, it’s a way of avoiding starvation as the growing season shuts down. Tufted titmice aren’t known to lower their body temperature at night the way our chickadees do, but that hasn’t kept titmice from expanding their range northward. Northern cardinals, northern mockingbirds, and red-bellied woodpeckers have also done so. 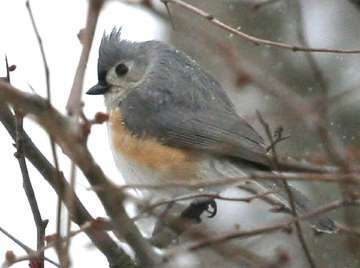 Titmice started breeding in Massachusetts about 50 years ago. Why did they come to place that’s so chilly in winter? One reason may be that the general warming trend over that period has made Massachusetts a less chilly place than it used to be. Residential development, and with it, the popularity of bird-feeding, also supplied more winter food, especially sunflower seeds. Finally, forests have returned to Massachusetts as agriculture declined, providing more acorns, beechnuts, and nesting areas. Titmice need tree holes in tall trees in the breeding season, unlike chickadees, which also use tree holes but nest lower down. As we look forward to spring, let’s be glad for the birds that add interest to our winter landscapes and for all their ways of keeping warm.